In 1985, everyone’s favorite protocol droid and astromech droid starred in their own animated TV series. Star Wars: Droids, featured R2-D2 and C-3PO on their early adventures that took place before Star Wars: Episode IV: A New Hope. 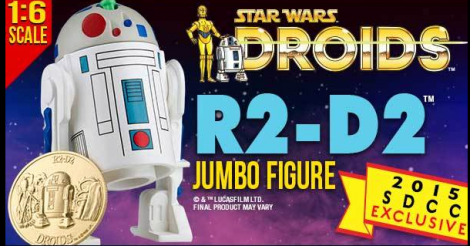 To commemorate the May the 4th and the 30th Anniversary of the Star Wars: Droids Animated Series, Gentle Giant Ltd is happy to announce one of our Star Wars San Diego Comic Con 2015 Exclusive Droids R2-D2 Kenner Inspired Jumbo Figure! This figure was digitally scanned from mint 3 ¾” Kenner originals and reproduced in 12” scale while maintaining all of the figure’s details. Injection molded with durable plastics, this figure features original articulation. The Star Wars: Droids R2-D2 figure will even feature a jumbo replica of the coin that came with the original figures! To further capture the vintage feel, Gentle Giant has packaged this figure with a Star Wars Droids inspired backer card featuring original photos and artwork. Designed with the collector in mind, the figure comes in a re-sealable plastic outer clam shell to help protect and display this limited edition figure. This limited edition R2-D2 figure will be one of the hottest exclusives at San Diego Comic Con 2015!